Markets have overcome systemic shocks to record all-time highs. Rally has begin to shift towards being earnings-driven as well, rather than being interest-rate driven. September could be a month of pause and consolidation as interest rate decision looms. Exposure to stocks has been a prudent strategy and remains so going forward. The small-cap sector continues to move higher with Russell 2000 up +7%, and Graycell Smallcap Portfolio up +55%. The stock market this year has shown an incredible ability to withstand and recover from systemic shocks. With the S&P 500 (NYSEARCA:SPY) and Nasdaq (NASDAQ:QQQ) recording all-time closing highs, it’ll be helpful to look at few of the drivers and what to expect over the remaining Summer. Brexit pushed the Federal Reserve, also referred as the FED, and major central banks into a more dovish stance. The FED’s timetable for interest rate increases was pushed-out, and the continuation of the dovish policy strengthened the recovery following February lows. Furthermore, the US economic news improved after an anemic initial readings of first quarter GDP report showing 0.8% growth. Following that GDP report, the consumer confidence and consumer spending, both surprised on the upside – a big relief for the market. The second quarter GDP advance estimate of 1.2% was better than the sub-1% growth of the previous two quarters, but was still a negative surprise as it was well below the 2.6% consensus estimate. However, the non-farm payrolls for June and July were reassuring, and also suggested a continuation of strong consumer confidence and spending trends in the upcoming months. In addition, second-quarter earnings have largely met or even exceeded expectations, including the technology sector which has a material influence on the Nasdaq index. However, the non-farm payrolls for June and July were reassuring, and also suggested a continuation of strong consumer confidence and spending trends in the upcoming months. In addition, second-quarter earnings have largely met or even exceeded expectations, including the technology sector which has a material influence on the Nasdaq index. A combination of the above has contributed towards a rising stock market. We had highlighted these reasons in our earlier articles on our Blog and Seeking Alpha, including Brexit Doesn't Mean an Exit on Stocks and Smallcap Stocks are Charging Ahead. The recovery from February lows has been robust and rewarding, particularly for those who stayed on the sidelines in January and early February, and then eventually didn't get shaken out by Brexit. As of the end of July, the Nasdaq had risen +3% for the year, while the S&P500 was up +7%. Small-cap stocks have risen strongly as well, with the Russell 2000 index (IWM) rising +7% over the same period. The Graycell Smallcap Portfolio was up +55%, after being in Cash for the first two months of the year as recommended in our article It's The Fed's Move Once Again. The broad-based rally has been recently spurred by the technology sector, which generally speaking has delivered better-than-expected earnings. The FANG stocks - Facebook (FB), Amazon (AMZN), Netflix (NFLX), and Google (GOOG) (GOOGL) - trading at all-time highs for the most part, are not the only ones driving the rally. 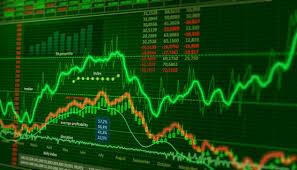 This rally has become more broad-based including semiconductor stocks like Intel (INTC), Nvidia (NVDA), Advanced Micro Devices (AMD) and Quad Graphics (QUAD), software companies like Microsoft (MSFT), Adobe (ADBE) and SAP (SAP), and Mining and Industrial companies like Barrick Gold (ABX), Agnico Eagle Mines (AEM), and United Steel (X). Even the Biotech sector is now contributing to a rally, as was pointed out in a recent article Is Biotechnology Finally Ready To Move Higher, with stocks like Amgen (AMGN), Biogen (BIIB), Celgene (CELG), Seattle Genetics (SGEN), and Ariad Pharmaceuticals (ARIA), breaking out of their trading range. Over August, we believe stocks will continue to perform strongly on greater confidence in economic growth and corporate earnings. Thereafter, in September we anticipate a rise in volatility and a temporary pause in the present trend as the market enters a consolidation phase. 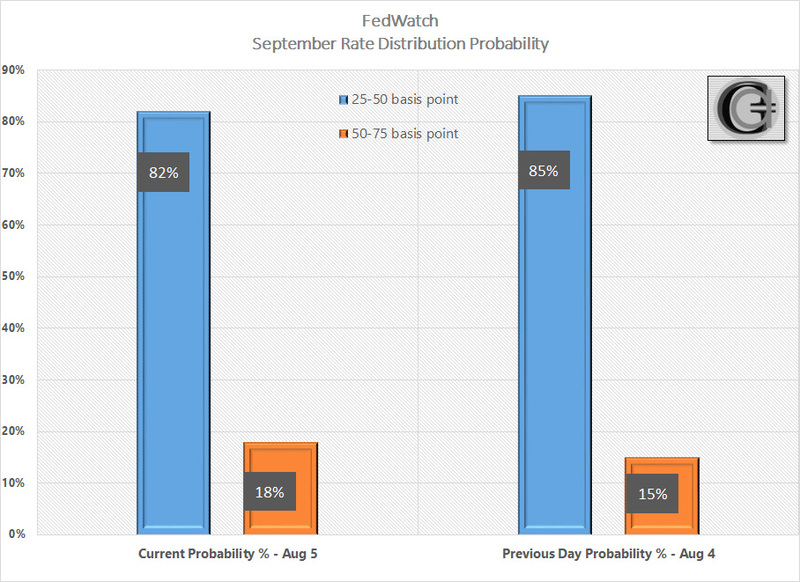 This will be a result of the pricing-in of the probability swings relating to a potential rate increase by the Federal Reserve following its meeting on September 16-17. The probability of a no-change in Federal Funds rate from the existing target of 25-50 basis points is presently pegged at 82% as of Friday, August 5, when non-farm payrolls were released, down from 91% a day before. Another vigorous 200,000+ non-farm payroll report on September 2, will obviously raise the probability of a September rate increase from the current 18%. However, there is an offsetting factor - the GDP report. A much weaker than expected second-quarter GDP advance estimate will influence the Federal Reserve to take a more cautionary approach towards further change in policy. Unless the second revision, referred to as the preliminary second quarter GDP report and expected on August 26, comes in materially better than the 1.2% advance estimate, we believe the Federal Reserve may restrain itself from a change in the interest rate policy during September. Whether an interest rate increase occurs in September or not, we believe the overall rally should remain intact as it is slowly shifting towards being led by improving earnings outlook, rather than being driven more by the dovish interest rate policy and corporate buybacks. If the Federal Reserve does raise the rates in September, there will be a period of natural adjustment and volatility into October. We believe late October will be a good time for the rally to resume as third quarter earnings are reported, and there is further clarity and confidence in terms of a forecast for November elections. Our prognosis is predicated on the assumption that, first, the economy continues to build on its new-found strength, which also bolsters the earnings improvement argument, and second, there is minimal election turmoil with some sort of status quo being maintained. The recent non-farm payrolls showed a growing participation in the workforce, as well as an improvement in wage growth, which was up 2.6% over last 12 months. Both underpin economic growth. 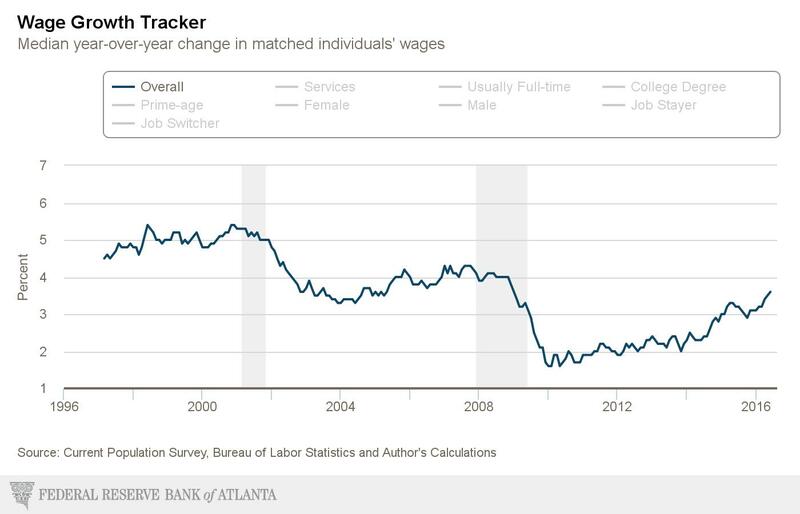 Wage growth is better than at any previous time in this staid recovery. However, there is another critical engine for economic growth that has been lagging and must show improvement to prolong and enhance the growth cycle. Business investment spending or private nonresidential fixed investment growth has been sub-par in this recovery, and after a decline of -2.2% in the second quarter of 2016, has dropped in four of the last five quarters. Prolonged negative growth in business investment spending is detrimental and suggestive of a looming recession. In this recovery, since 2010, the measure has dropped into negative territory three times, only to bounce back by next quarter. We believe due to election uncertainty, the quarterly business spending measure will remain flat-to-down over the remainder of 2016, but most likely begin to move higher next year once there is political as well as economic-policy clarity, following the November 2016 elections. We believe a low interest rate environment, and improving signs of economic growth and corporate earnings, will continue to underpin a rising stock market. Although the September to October time frame will require volatility-related near-term caution, the rally should continue thereafter within the assumptions cited above. Our recommended small-cap portfolio has benefited from the broad based rally and is up 55% for 2016 as of the end of July. The Russell 2000 index has kept pace this year with the broader indexes, and we anticipate it too shall make a new high, which requires an advance of another 4%. There are a number of small-cap companies that look promising, and besides ones mentioned earlier, some others representing a variety of sectors include: Minerva Neurosciences (NERV), Coherus Biosciences (CHRS), Exact Sciences (EXAS), Exelis (EXLS), Advaxis (ADXS), Cliffs Natural (CLF), Clayton Williams (CWEI), Coeur Mining (CDE), Gold Resource (GORO), Etsy (ETSY), Groupon (GRPN), and AK Steel (AKS). The essence of this article is to suggest a continued exposure to stocks at this time, even after the recent rally. The above expectation of stock market outlook is a framework to guide our investments. Even though over the past two years our market outlook has been very close to the mark and is well-reflected in the performances of our various portfolios, it doesn't mean that the thesis will continue to be accurate. This investing framework will require adjustment and adapting to new information as market conditions evolve. So as always, do your due diligence.